A Katyusha barrage was fired Thursday at the Nahariya area in the Western Galilee. Police reported that two people were lightly wounded and evacuated to the local hospital. Five other residents were treated for shock. 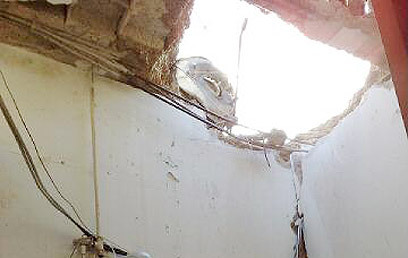 Police sappers received reports of at least two rocket hits: One rocket directly hit a nursing home in Nahariya and the other landed in the town's vicinity. The IDF Spokesman in the GOC Northern Command said Thursday that "the rocket fire on the Western Galilee was carried out by Palestinian elements in Lebanon, wishing to drag Israel into war. "Israel holds the Lebanese government and its army responsible for thwarting any fire on Israel." 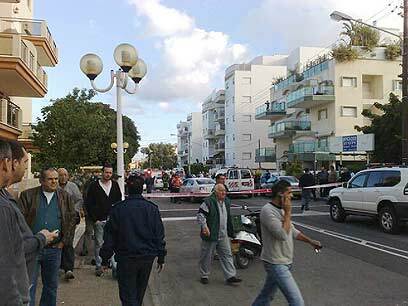 At around 10:55 am sirens were heard in Nahariya and the Western Galilee, followed by loud explosions, but the district police reported that the explosions were caused by supersonic booms and that no additional rockets were fired at the country. The rocket in Nahariya damaged several solar water heaters and caused windowpanes to shatter in four buildings in the area. Residents rushed to take cover in shelters and fortified areas, as children throughout the town were making their way to school. The Magen David Adom emergency services raised their alert level to the maximum following the attack. The Home Front Command instructed the residents of Nahariya and the neighboring community of Shlomi to remain indoors and in fortified areas or shelters, while the inhabitants of the Western Galilee communities have been instructed to remain close to fortified areas. Commander of the Police's Northern District Shimon Koren told Ynet that two rocket landing sites have been located, and branded the attack was "a severe incident." According to the police commander, his forces received no prior intelligence on a potential attack. "However, we are deployed in great numbers in order to handle possible rioting in the Arab sector and in light of the possibility that the security situation in the north might change," he stated. Koren said that the Home Front Command's instructions were to only open shelters in the communities that were hit and that there was no instruction to cancel school. Nevertheless, local authorities in Nahariya and Shlomi decided to keep the schools closed. Hizbullah's television station al-Manar reported of the Katyusha attack at northern Israel, but did not attribute the fire to the organization. The IDF shelled the areas in southern Lebanon from which the Katyushas were fired. The Northern Command convened for an urgent meeting to evaluate the situation, and will discuss the possibility that the region could flare up if the armed groups in Lebanon decide to launch attacks to show their solidarity with the Palestinians in Gaza. A Lebanese government official said the country is trying to determine who launched rockets at Israel. The official also said Lebanon is committed to a UN-brokered truce that ended the brutal 2006 war between the militant group Hizbullah and Israel. A Lebanese source was quoted by the paper as saying that the Shiite group is determined "not to give Israel a chance to avenge its defeat in the July 2006 war and has therefore raised its alert level for defense purposes." See all talkbacks "Rockets hit northern Israel "